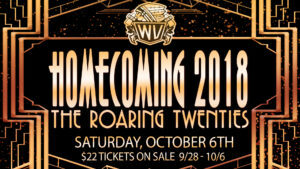 Tickets for Homecoming 2018 “The Roaring Twenties” are now on sale through TicketSpice. This year tickets are only available online and will not be sold in person at Waubonsie. Ticket sales will run from Friday, September 26th through the afternoon of Saturday, October 6th. This year’s homecoming dances is shaping up to be one of the biggest in Waubonsie Valley history. Let’s set a new record for student attendance! If you wish to bring a guest to Homecoming who does NOT attend WVHS, you will need to download, print, and complete a Guest Pass form. THIS FORM MUST BE SIGNED BY and SUBMITTED TO YOUR HOUSE DEAN. You must turn your completed Guest Pass into your House no later than 2:25 pm on Friday, October 5th. Guest passes will NOT be accepted at the door. If you show up with a guest who does not have a previously approved guest pass, your guest will not be admitted.